I like heroic role-playing games. For me, it’s great if characters can do zany stuff. I dislike systems where my base chance of success is something like 20-30% because I feel like my character is a nitwit and can’t do anything (Dark Heresy, I’m looking at you!). Likewise, I like simple games where the rules get out of the way. That’s why I appreciate Mini Six, a stripped-down variant of the Open d6 System. I already reviewed the Mini Six standalone product Breachworld (aff) HERE. While researching Breachworld, I stumbled over the newly released Project (aff), another d6 game. I asked the author for a review copy of the PDF and here we are. 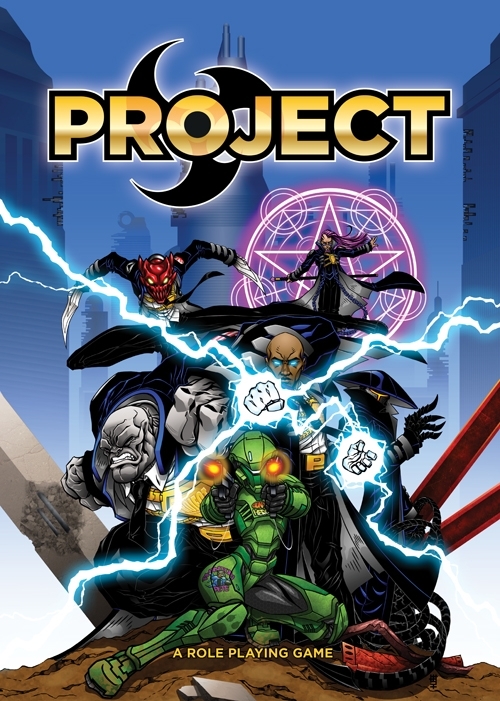 PROJECT is a role-playing game about heroic guardians of reality. After a terrible, supernatural disaster the world has been rent asunder and strange things have begun to bleed in all around the edges. Humanity has recovered to an extent and continues to fight these beings and forces from beyond known as ‘Entities’. The group PROJECT is at the forefront of humanity’s defence, using the strange technologies and abilities of the Entities against them and reasserting reality one bloody fight at a time. Sounds good? I think so, too. You can buy the PDF for USD $10.99 HERE. A print version will come soon, distributed by Chronicle City. Personally, I’m a bit conflicted as the publisher hasn't been very reliable in the past. The game is a post-apocalyptic RPG where you play modified humans (cyborgs, psi users, empath, A.I.s etc.) and battle monsters from other planes of existence. Players are employees of a near-government-organization called PROJECT. Project takes place in the future, after a worldwide catastrophe, the Mindquake, has driven the world into chaos. Three centuries later, humanity has recovered but the earth is not the same as before. The game doesn't take itself too seriously, nations are some kind of stereotypic versions of the real world. For instance, in America the gap between the rich and the poor is predominant and Americans embody the cowboy archetype. The game includes a synopsis of the history of different regions: Britain, America, Japan, Africa, Eurasia and more. Wealth and power are centered around a few selected: monarchies, corporations, and wealthy families. However, the major player is PROJECT itself. Generally, the world reminds me of a mix between post-apocalyptic elements, sci-fi, and cyberpunk. Case in point, Psykers, Wytches, and Empaths use PME (Psycho-Magnetic Energy) to manipulate matter. So basically, there is some supernatural element but it’s not flavored as fantasy magic. Powers are obtained by implanting technology into the brains of agents. The world glossary contains jargon like “A-Grav” and “Splice Technology”. The world information is a bit sparse as more material is planned for supplements. While it is enough to get you started and to evoke the feel for the game it, unfortunately, doesn't come with detailed information. You create your character in a step-by-step process. You need to pick a Character Template and customize it, choose Advantages & Disadvantages, calculate some values (Wound Level etc. ), equip yourself and that’s it. That means that the process is reasonably fast and easy. Every template comes with pre-generated attributes and skills. You have Customization Points to adjust it to your liking. Sadly, with only a small amount of those points and a steep price point you need to stay close to the template. I must say that the templates are pretty awesome. You have the Psyker who can manipulate kinetic energy or the Empath who controls psychic energy to warp your brain. The Golem is a big muscled brute with a simple mind. Golems have an “Object of Desire” (a so-called binky) which they need to calm themselves down. A very interesting template is the Borg, a human who is transplanted into an artificial high-tech body. The body is modular and can be enhanced. Borgs use “masks” to express themselves, every Borg has a public mask and several others which he can change. They are good at stealth. Grunts are soldiers and the most human of the bunch. They can use PME armor and weapons. A Wytch is another template that uses psi energy. They can summon, bind and control Entities from other realms and have a familiar. A Medusa looks like those metal octopus thingies from Matrix and is an A.I. Medusas have a set of laws that prevent them from harming PROJECT or their agents. Psi powers are modeled with skills, so a psychic character will want to choose Kinetic Blast (Psyker) , Magic Heal or Homunculus (Wytch, it’s a permanently summoned creature) or Psychic Telepathy (Empath). You may further customize your character by choosing Advantages and Disadvantages. The author provides a general list as well as template specific Advantages & Disadvantages. That’s really neat! Examples include “Extra Body Part” for Borgs or “Extra Laws” for Medusas. I must say that I really love the templates, they are pretty cool and there were several that I immediately wanted to play. Customization points are limited though, so your character will be close to the original. You can mitigate that a bit by using Advantages and Disadvantages, but major changes will not come until your character advances. I like the Open-d6-family for its unified core mechanic. Attributes and skills have a die value like 3D and if you want to make a task check you roll that number of six-sided dice and aim to score higher than a target number. That’s pretty easy. Project uses the Wild Die from the 2nd edition of Star Wars (?). It’s an exploding die, that means that if you roll a 6, you can roll it again and add the result to your roll. At the same time, a 1 needs to be rolled again and be subtracted from the result (roll it again as long as you keep rolling a 1). This adds a random (and heroic) element to the game. The game has 7 Attributes: Strength, Dexterity, Endurance, Wits and Intelligence are fairly self explanatory. Technology shows how much you understand and can use computers, bypass security etc.. Technology based skills are, for example, Demolitions, Medicine or Navigation. Psionics shows if and how well you can control psycho-magnetic energy. Combat uses a rounds and initiative. There are also rules for multiple actions, helping each other, rushing or taking your time, called shots etc.. Characters don’t have hit points. They use Wound Levels in place. As an offshoot of Open d6 they game uses active defense: When you are attacked you roll your Resistance score and add armor. This is a derived stat which is a subset from the Endurance attribute. The attacker’s margin of success determines the amount of damage: Stunned, Wounded/KO, Incapacitated, Mortally Wounded, Dead. How fast and easy you heal also depends on your Wound Level. Fate Points can be used to roll double the normal number of normal dice. You get one FP per session. During play characters earn Character Points. These experience points can be used to advance your character. As you can see, the d6 family does not use a level-based system. Interestingly, Borgs can also enhance their artificial bodies by purchasing more hardware with money instead of experience points. What I also like about the d6 system is the scale modifier which models size and damage differences between larger vehicles or weapons. Project only mentions vehicles and weapons but I assume that you can also apply them to monsters. At least that’s how it works in Mini Six. Rules for vehicles are included (vehicle stunts, ramming, stunts and more). The ruleset is a good choice for a heroic system and I like it for its blend between traditional mechanisms and more modern parts. Personally, I prefer the even more streamlined Mini Six rules but Open d6 is a nicely done ruleset as well. Check out the freely available rules HERE if you want to delve deeper. Every agent has a standard equipment with weapons, a tablet etc.. There is also some interesting stuff like a Chameleon Cloak or a Goo-Goo-Tank (it’s a Bacta Tank…). This is a useful chapter and explains basics as well as setting-specific tips. There is some guidance on how to adjust the game for different styles of play: investigative, horror, action or high octane. While it’s a bit generic it’s still useful advice. Furthermore, there are stats for NPCs and adversaries which I always find practical. Additionally, there is also rules for how to create your own Entities. This chapter also comes with information about how PROJECT is organized, about their public perception, ressources and offices. Last, there is help on creating missions for your players and some adventure seeds. I like how the book takes you in. At first, you have an “Employee Manual” which you could theoretically give the players. This part is like an introduction for players and explains the setting in broad strokes as well as the different player templates. I like how it addresses the PC as if he was a fresh recruit for PROJECT. Next up is general world information, game rules and last is the GM chapter. The game does a good job explaining common game and setting terms in glossaries. The PDF has 116 pages total and is not electronically bookmarked. The cover already shows the heroic premise of the game, it looks like a superheroes cover. The book comes in black and white with functional two-column layout. It looks modern and fits the genre nicely. Every character template has a good-looking logo associated to it. I really like how that looks. The artwork is very sweet with clear lines and good contrast, again very superheroes-like. Unfortunately, it doesn't have a lot of pictures. All in all, it looks like a well made text-heavy roleplaying book. It doesn't stand out in your shelf because of an exciting look but it doesn't disappoint either. Project doesn’t take advantage of the electronic format. Compared to Breachworld it has a more hard-nosed feel and is missing the color coded chapters and the full color artwork. On the plus side, the game comes with pregens. I reviewed Breachworld on my blog but here is a short blurb if you didn't read it: Breachworld is a post-apocalyptic kitchen sink game based on Mini Six. Humans used teleportation Gates centuries ago but the technology failed and opened so-called Breaches. Otherworldly beings and environments could enter earth. Now, centuries later, humans and aliens live in a pre-industrial society but there is also advanced tech left from the Golden Age. Sounds familiar? Yes, it is. Project is more focussed than Breachworld. Project’s setting is technologically more advanced and more in the realm of sci-fi than fantasy. Players are already part of an organization and have distinctive roles and tasks to fulfill. Breachworld is more post-apocalyptic, has more diversity and versatility (sandbox style) and has way more options. There are are far more “spells” in Breachworld because as an Epic you are not limited to a specific branch of “magic”. In my opinion, there are more ways to customize your character in Breachworld than in Project. Yet all those options could confuse players and GMs. Both approaches are viable and come down to your personal preference. Project also has advice for the Game Master, something which I’m missing from Breachworld. On the other hand, visually Breachworld has the upper hand as it is a full color book, has way more artwork and handy color-coded chapters. The Character Templates are pretty awesome, especially the Medusa and the Borg. While I feel that the Psyker and the Empath are a tad too similar the rest of the bunch looks intriguing and diverse. I also like the inherent (subtle?) humor in the setting. There is enough conflict externally (otherworldy Entities) as well as internally (is PROJECt really as altruistic and what is it about their Internal Affairs section?) Plus, the game addresses different continents and doesn’t concentrate on the author’s home country. The GM chapter is useful, too, and the adventure seeds give you some ideas. The Open d6 system also fits my preferences of a simple game with a mix of traditional and modern elements. What would I’ve liked to see? More details: the world information is sparse. The author has planned further supplements so perhaps that’s in the making? The PDF should be bookmarked. Project is exactly what it aims to be: a heroic/superheroic game about agents protecting earth from alien Entities. While the setting information is a bit scant, the book makes it up to you by providing some very interesting character templates. If you like post-apocalyptic settings with a touch of sci-fi, cyberpunk and psionics this could be the game for you. A Quick Peek at White Star!